Because of our diverse customer base, we are familiar with, and have tooling for, the particulars and common features involved in many different industries. We also provide Inventory Management for our customers. We can set up annual blanket orders and ship on a scheduled or as needed basis. This saves our customers money by being able to take advantage of volume pricing, and by not having to purchase parts until you need them. It also means you won’t need to manage the parts in your inventory. In addition, we have a “dock to stock” relationship with several of our customers. Because many are so confident in the quality of our products, they are able to bypass their incoming inspection and put our parts directly into their inventory. This confidence in our reputation enables our customers to streamline their operations more easily. 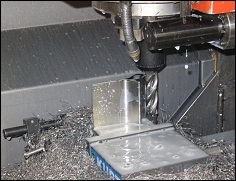 Please contact our Sales Team with any of your machining needs. We can accept most file formats via email, or you may fax or mail any requests for quote.